“America’s Official Font Named by Congress to forever be Copperplate Gothic Bold!” will be the most glorious headline to ever grace our nation’s papers if our hard work is continued! We are more than happy to lead the charge to lobby this most pressing issue with congress, and quite frankly it’s about time. There is nothing more American than Copperplate Gothic Bold…nothing. Compelling facts for a compelling cause. Congress needs to stop the bipartisan bickering, sit down, and agree to something that we can all believe in: America’s Official Font should be Copperplate Gothic Bold. The original creator of The Font was Frederic W. Goudy, a true blooded American born in Bloomington, Indiana, 1865. Fred Dubs (affectionately called by his close friends) was rumored to keep a pack of wild bald eagles in his backyard as pets and used to hand feed them with a homemade elixir of bourbon and moonshine that he distilled in his basement. The birds were completely docile until shown the font comic sans at which point they would go into a complete state of rage and destroy every instance of the offending font. He was also rumored to have one of the largest American flag collections outside of Betsy Ross and the heirs to her estate. America was founded on diversity and freedom. 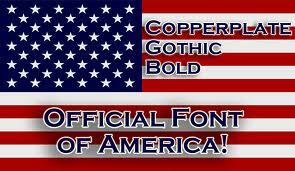 What is more diverse and free than having America’s Official Font being named Copperplate Gothic Bold? So please, do your part. Contact your local congress person and let them know that you demand that Copperplate Gothic Bold be named America’s Official Font.